Marathon length: 50 km in free style cross country skiing. Date: First Sunday in April. Start at 11:00 o'clock. The control post at the finish line closes 6 hours after the start. Necessary documents for registration: Passport, registration form with signed statement that you are participation for own risk and consequences. Closing time registration: 3 days before start! The Festival of the North (Prazdnik Severa) itself was first held in 1934 and the first Murmansk Ski Marathon took place on March 31, 1974. In the first 14 years of existence the distance of the marathon varied from 52 to 60 km but in 1988 it was reduced to 50 km and it has not changed since. Women started participating in the marathon in 1986. 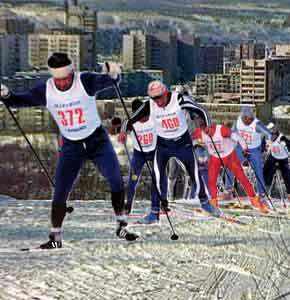 In 1999 the Murmansk Ski Marathon joined EUROLOPPET, the European long-distance popular ski race series. 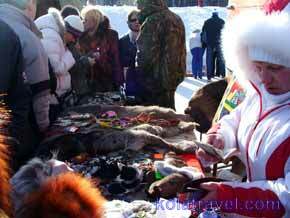 The Murmansk Ski Marathon is stage for the Russian Ski Marathon CupRUSSIALOPPET. 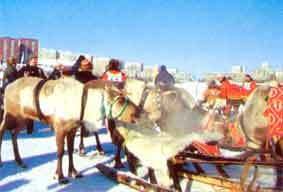 A day at the reindeer races! For groups we can offer bus transfers from Rovaniemi, Salla, Ivalo or from Kirkenes to Murmansk and back. Murmansk Ski Marathon is usually held on a first Sunday in April in Murmansk and is part of the traditional Festival of the North (Prazdnik Severa). The Festival of the North is an annual sports event in about 20 winter sports that takes place in the towns of the Murmansk region in March and April. On the 6th of April 2011 the famous cross-country ski marathon will start for the 35th time. Do you like to participate on the unique ski marathon during the Northern Festival week? Shuttle busses will bring you from the hotels to the sport complex where the marathon starts. Day 1, Friday: Day of arrival in Murmansk airport. Transfer by a taxi to a hotel. Overnight at the hotel. Day 2,Saturday: For training you can use cross-country ski tracks close to the city. 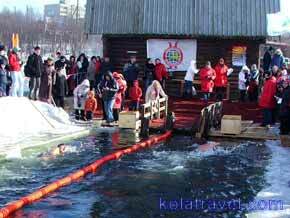 The same day a reindeer racing competition starts as well as ice swimming competition on Semyenovskoe Lake. Overnight at the hotel. Day 3,Sunday: At 11:00 o’clock the ski Marathon starts. The same day Lappish Games are on the same sport spot. In the evening – a festive rewarding ceremony of winners of the Marathon on the central square. Overnight at the hotel. Day 4,Monday: Departure by a taxi to Murmansk airport. We also offer you a training ski tour before the Ski marathon. See program overview.